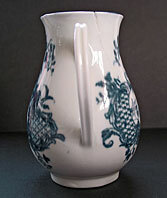 "A delightful elegant little gem of Worcester eighteenth century English porcelain. 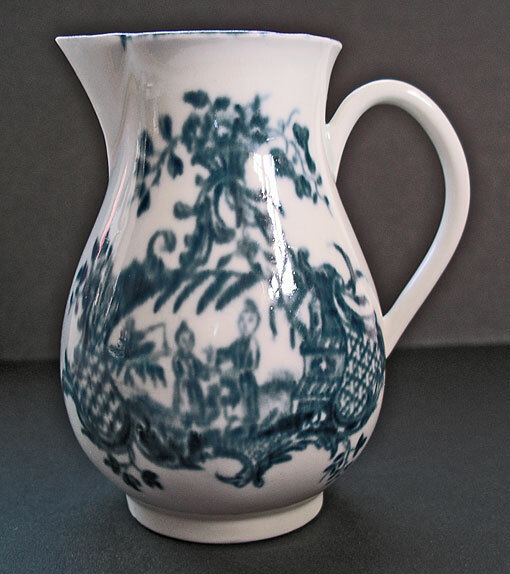 This finely potted Worcester sparrow beak jug of larger than usual size was produced around the 1770s at the renown First Period Worcester Porcelain Factory. Attractive transfer printed decoration - the uncommon and descriptively titled Mother and Child and Man Fishing BFS. II.A.17. An intriguing combination of styles with classic Chinese figures framed within an ornate rococo border motif. 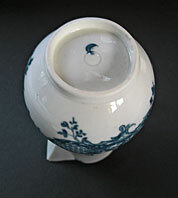 This exact design is unique to early Worcester; examples can be found in the Museum of Worcester Porcelain and in the Victoria and Albert Museum collections. 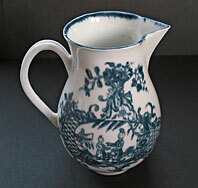 A super piece of eighteenth century English porcelain for the discerning ceramics collector." Antiques Expert Hamilton Bear. 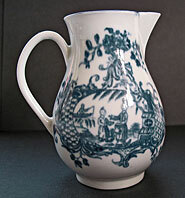 References: For an example of the Mother and Child and Man Fishing pattern on a finished teabowl and a factory waster see The Illustrated Guide to Worcester Porcelain 1751-1794, Henry Sandon plate 132. Dimensions: height 92 mm max. Marks: Worcester crescent mark as illustrated. Condition: In excellent general display condition with no restoration. There is a minute pin-prick of a bruise chip to the tip of the spout. Also a distinct clean crack at the back of the rim near the handle - which looks like it may have started life as a shrinkage/firing crack. 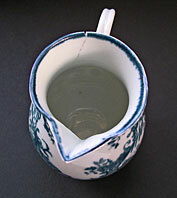 An associated fine hairline extends from this part way down the side of the jug. 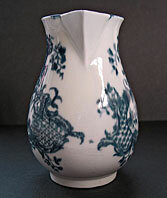 The jug is not weakened, remains very sound and displays superbly from conventional viewpoints. UK GBP � STERLING OR US $ DOLLAR PAYMENT.